When is a treehouse not a treehouse? 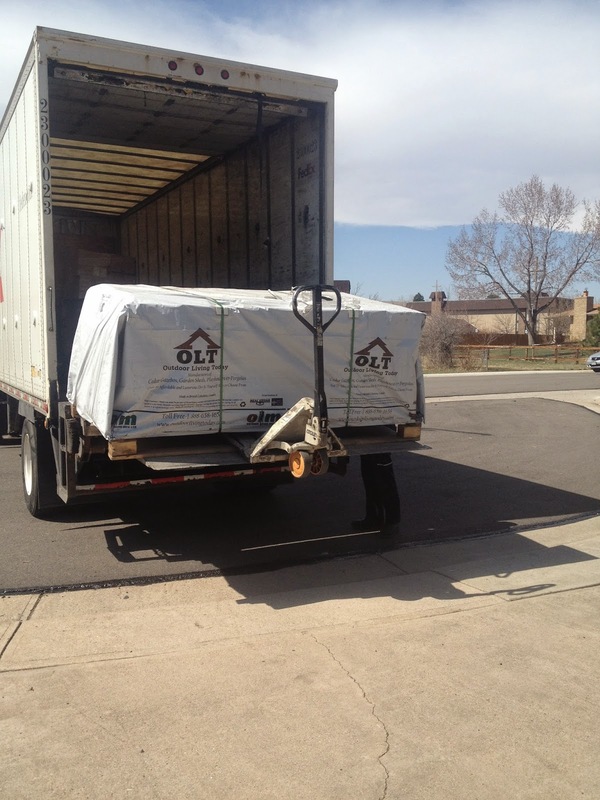 The pallet came off the truck with a weight of just under 1,000 pounds. That meant even if I used every piece, I’d be under my target weight. By a lot. Impressively, one guy got this out and into my garage. 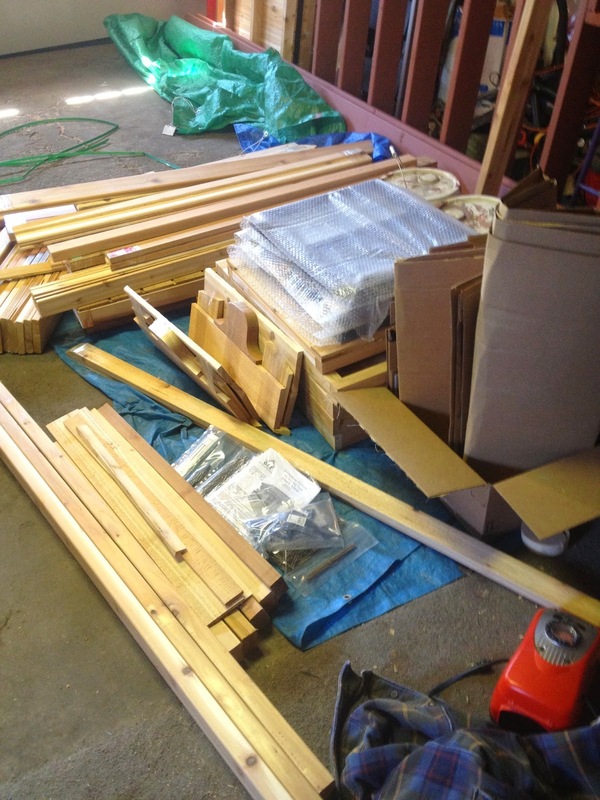 I’d ordered a cedar playhouse kit that came somewhat panelized; in addition to the walls going up in (sort of) pre-made pieces, the roof framing was all pre-measured and pre-cut; all I had to do was stain it and put it together. The total size would be 6' x 9', basically a 6' x 6' "playhouse" area with a small covered porch on the remaining. 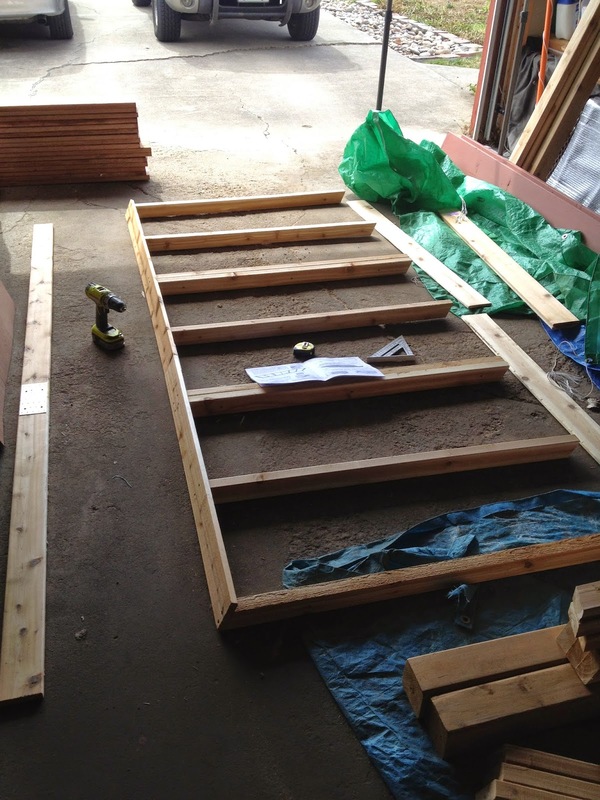 With my 8' x 11' platform, it was ideal; about a foot to play with, all the way around. Insert tab Y into slot X. Hoo boy. What’s more, there were a lot of cute details included (also pre-cut), such as a door and a few lightweight windows that actually worked. I’d have to modify the kit considerably for matters of safety and my needs — for example, the included railing, while perfectly fine for protecting children from a fall of six inches, needed to be beefed up considerably for a 30-foot-high treehouse. And I’d have to work around the instructions and do a lot of things out of the prescribed order. Simple instructions that included steps like “walk around the structure, nailing X to Y from the outside” needed to be re-tooled for treehouse purposes. And of course I’d do as much assembly and staining on the ground as possible. But I was convinced it would work. 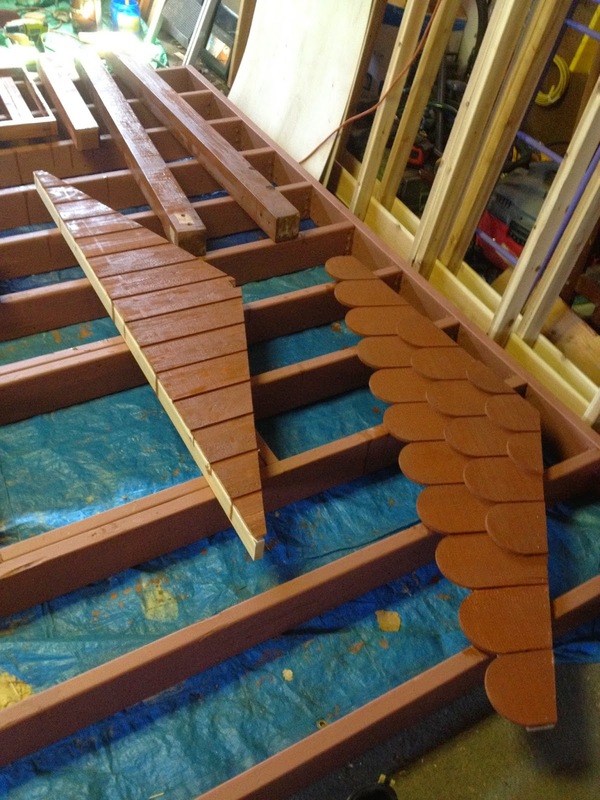 I started unpacking the pieces and putting together what I could, such as sections of the roof. Mostly it went together with included screws. I joke, but it's a lot easier than doing it from scratch. 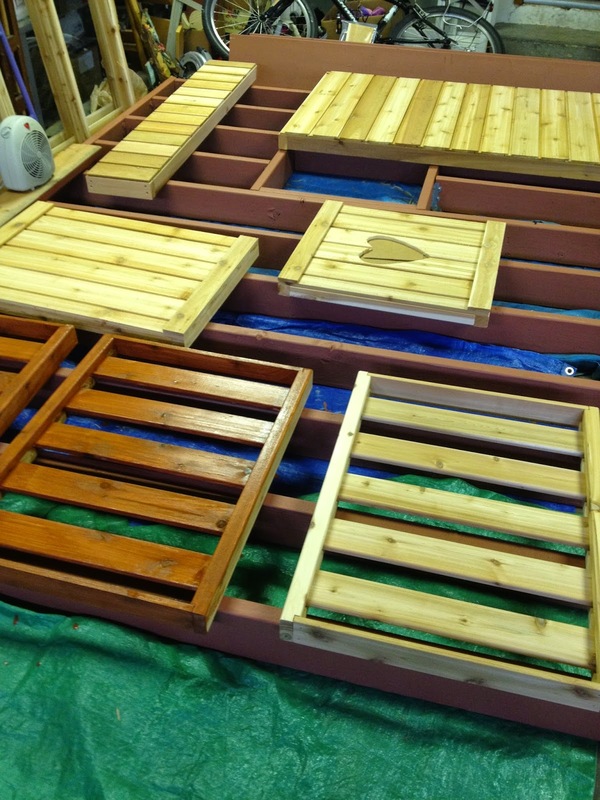 I also assembled as many panel sections as I could, and started staining them. The completed floor framing turned out to be a great place to do that. I also measured, cut, and stained a few pieces of lumber I’d determined would be part of the modification process — and a few extra pieces, so I’d have them around. Building little boxes. Being cedar, I suppose I didn't have to stain it. But I figured it'd be unlikely I'd want to go up in the tree and do it later. Also, how cute is the heart cut-out? Those big 4x4 cedar posts are replacements for shorter ones that came with the kit. Since I'd be 30 feet in the air, I wanted my railing posts to get carriage-bolted to the treehouse floor framing, rather than just be toenailed in as the kit suggested. Notice I pre-drilled them on the ground -- I also drilled through the corresponding 2x6s in the floor framing. It seemed at the time important to get the treehouse up in as few days as possible once I began the process. I wanted to get everything lined up in the garage well in advance, then haul it all into the tree and put it together in a couple of days. It was an ambitious schedule, but the treehouse was an ambitious project. Painting is a good time to think, and while I was staining the assembled panels I figured out, in theory, how I was going to get the kiddos up and down in safety. It was, however, going to be a lot of work. And I’d need some good treehouse rope.